Installation of the BTE Full Manual Valve Body will eliminate any automatic features. The transmission will have to be manually shifted into all gears. IMPORTANT: Before you begin installation allow transmission to cool to avoid burns from hot fluid or parts. Select a well-lighted work area and it is very important to keep all parts clean. Use a box or pan to keep transmission parts from getting misplaced. Wash parts thoroughly with a good solvent and replace any components that show excessive wear. NOTE: Refer to a motor manual or service manual for general disassembly instructions if you are not familiar with automatic transmission repair and assembly. STEP 1 Drain and remove transmission from vehicle. STEP 2 Remove transmission oil pan, valve body, tailhousing, governor, governor (rear) support, front pump, band, clutch drum, planetary, reverse clutches, reverse piston, and detent plate. 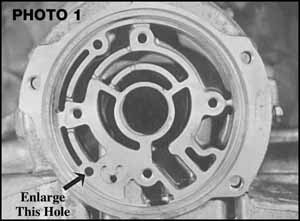 NOTE: Early model (’64-’66) Powerglide transmission have rear pump gears, skid plates, and drive pins. These must be removed during disassembly. After the BTE Full Manual Valve Body has been installed and you are ready to reassemble the transmission, YOU MUST reinstall the OE skid plate only. The gears will not be reinstalled. When you are removing the governor, be careful not to tear the support gasket as it will be reused. Do not remove the O-ring from the governor support during disassembly. STEP 3 (see Photo 1) After transmission has been disassembled you will need to enlarge hole shown. Using a 3/8” drill, drill through back of case, smooth and deburr both openings of the hole. STEP 4 (See Photo 2) Inspect thickness of case. If you have enough metal, use a 3/8” to drill this hole. If case is not thick enough use a 5/16” drill. This hole will intersect with hole that was drilled in step 3. NOTE: Steps 3 and 4 are not necessary unless the customer wants to prep the case for future installation of a trans brake valve body. STEP 5 Clean case thoroughly to remove any aluminum shavings. STEP 6 DO NOT BOLT STOCK DETENT PLATE onto the new BTE Full Manual Valve Body. This design does not require this stock item. NOTE: Some Powerglide transmissions came with only eight (8) clutches [four (4) Friction and four (4) Steel] and some came stock with ten (10) clutches [five (5) Friction and five (5) Steel]. BTE recommends using a ten (10) clutch set-up for better performance and reliability. Do not use the steel wavy cushion plate, if equipped. Replace with flat steel clutch plate. Clutch clearance setting for ten (10) clutch set-up: .060" -.080". Clutch clearance for stock clutch pack: Use stock clearance. Since you have NOT modified the reverse piston and are using the stock configuration of clutches (replace wavy cushion plate with flat steel clutch plate), the clearance will be acceptable as set. STEP 8: Check High Gear clutches. If there is a wavy cushion plate present, discard and replace with two (2) flat steel clutch plates. Scrape all old valve body and pan gasket material off of case. Be sure that the transmission case is absolutely clean where the valve body mounts. 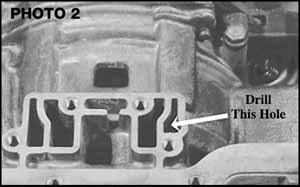 Any old gasket material left on the case can cause the valve body and/or the transmission not to function properly. Install internal transmission components as disassembled. Make sure that the band struts are properly positioned before installing the new BTE Full Manual Valve Body. Valve Body: Install the valve body onto the case, being sure to insert the servo tube into the hole in the case and align the manual valve to the pin on the manual valve lever. Make sure groove in manual valve is indexed with pin in selector range cam. Torque Valve Body Bolts: After you have bolted the valve body to the transmission case, torque the bolts to 12-16 foot/pounds. Torque Pump Bolts: 13 foot/pounds. STEP 10: Reinstall transmission pan. Use new gasket if needed. Torque Transmission Pan Bolts: 10-12 foot/pounds. STEP 11: Low Band Adjustment: Torque band adjusting screw down to 72 inch/pounds and back off (counter-clockwise) three and one-half (3-1/2) complete turns. STEP 12: Replace the transmission modulator with BTE plug that is included with valve body. Remove gasket from OE modulator and install on plug. Screw plug with gasket into modulator hole. STEP 13: Reinstall converter into transmission and reinstall into vehicle. After transmission and converter are properly installed, fill transmission with four (4) quarts of Type F automatic transmission fluid or BTE Super Shift Part#940600. STEP 14: With the rear wheels off the ground, start engine in neutral and check fluid level. Using dipstick, check fluid level. Add fluid until the fluid is between the "add" and "full" marks on the dipstick. Shift transmission into each gear. Recheck fluid level in neutral and add fluid, if needed. DO NOT OVERFILL. Turn engine off and check for any transmission leaks.